The Best Western Barkly Motor Lodge is a brand new motel offering guests a fully licensed restaurant for lunch and dinner as well as room service meals. We are centrally located only one kilometer from the city centre, close to Sovereign Hill, Gold Museum and Parks. 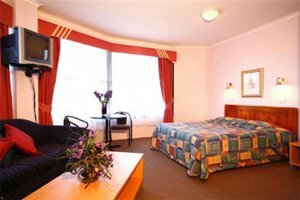 Our rooms include color television, electric blankets, refrigerators and a work desk. * .05 kilometer(s) from markets, Visit the craft markets or the Trash and Trivia Markets for some interesting bargains. Top Activities: * .5 kilometer(s) from Gold Museum, Houses a collection of alluvial gold, coins and nuggets. * .5 kilometer(s) from Blood on the Southern Cross , A spectacular sound and lighting show telling the story of Australia's only civil uprising of 1854 - The Eureka Stockade. * .5 kilometer(s) from Montrose Historic Cottage and Eureka Museum, Classified by the National Trust and the only remaining miners bluestone cottage in Ballarat. * .5 kilometer(s) from Sovereign Hill, An award winning attraction that gives visitors the opportunity to experience life as it was back in the 1850's and in the goldrush era. * .5 kilometer(s) from Ballarat Wildlife Park, A rich collection of Australian wildlife in 16 hectares on natural bushland. See the koalas, wombats, kangaroos, crocodiles and many more. * 1 kilometer(s) from Arch of Victory , A monument which honours those Ballarat residents who volunteered for service during World War 1. * 1 kilometer(s) from Historic Museum, Features photographs, literature and letters relating to Old Ballarat. * 1 kilometer(s) from Begonia Festival, Home of the spectacular Begonia Festival, Ballarat's largest festival. * 2 kilometer(s) from Wine tasting, Wine tasting at the wineries around Ballarat, the Grampians and the Pyrenees. Gold panning at Sovereign Hill. * 3 kilometer(s) from Lake Wendouree, A popular spot for cycling, sailing and fishing. * 3 kilometer(s) from Tramway Museum, The Ballarat Tramway Museum Inc. run trams on a 1.3 km track along the western shore of Lake Wendouree. * 5 kilometer(s) from Macarthur Gallery, Contains a display of fine ceramics, hand-blown glassware and quality artwork. * 5 kilometer(s) from Kryal Castle , A medieval castle featuring live re-enactments, magic theatre, glass blowing, magna carta, dungeons, a torture chamber, a comical cemetery and much more. * 5 kilometer(s) from The Great Southern Woolshed, A fair dinkum Aussie attraction featuring sheep shearing, Aussie food, working sheep dogs, a museum collection and Australiana shops. * 5 kilometer(s) from Horse racing, at the Ballarat Turf Club * 7 kilometer(s) from Ballarat Aviation Museum, Home to a collection of military, vintage and classic aircraft as well as photographs, models and memorabilia representing aviation history. * 10 kilometer(s) from Kirks Reservoir, Surrounded by magnificent gardens displaying a high degree of horticultural skill. * 10 kilometer(s) from The Gong Gong Reservoir, Contains an interesting collection of native flora. * 15 kilometer(s) from Springmount Gallery, An impressive collection of Australian paintings, sculptures and antiques. * 15 kilometer(s) from Springmount Pottery , Features fine Australian pottery. * Eureka Stockade Center - Built on the site of one of the most significant events in Australian history, this centre seeks to bring to life the Eureka story. * Ballarat Fine Art Gallery - Australia's oldest, purpose built gallery, containing a collection of Australian art with particular emphasis on the Heidelberg School, the Lindsay Family and the original Eureka flag. * Ballarat Botanical Gardens - Covering 40 hectares, this garden features rare and exotic trees, annual displays and conservatory displays. * Kerriedancer Gardens - A large private garden featuring camellias, azaleas, fuchsias, rose gardens, fish ponds, pergolas and walkthroughs.